This article show you how to check and adjust the maximum message size and upload size to an email via the Zimbra MTA (Postfix). The default Postfix message_size_limit was 10MB (10240000 bytes) and the message_size_limit postconf parameter is configured globally for all zimbra MTAs. Q. How to Adjust the Zimbra Maximum Message and Upload Size via command line interface (CLI) ? zimbraMtaMaxMessageSize = Refer to message size of the email. zimbraFileUploadMaxSize = refer to file uploads include attachments to messages, appointments, tasks and etc. 4. Change zimbraMtaMaxMessageSize and zimbraFileUploadMaxSizeto 40MB (40960000 bytes) globally. Q. How to copy or Move the files and folder based on date modified on linux ? Python is a popular programming language, which is widely used, high-level programming languages ? ?and has a design philosophy that emphasizes code readability. It is considered as a programming language that is easy to learn and master because of its focus on readability. Python syntax allows programmers to express concepts in fewer lines of code as possible in languages ? ?other programming such as C ++ or Java. This article show you how to check and verify the version of Python on CentOS 6, CentOS 7, RHEL 6 and RHEL 7. When you need to add a hard disk or network interface cards on the new VMware virtual machine on the production server, but you are not allowed to shutdown the server or you have several related issues as below. 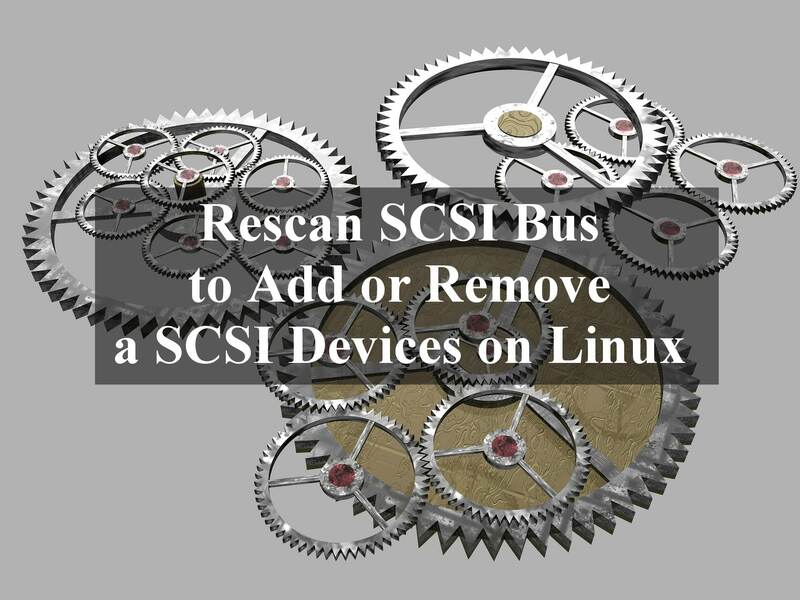 The following quick article shows how to rescan SCSI Bus to add or remove a SCSI Devices on Linux. This steps may work on CentOS 5/6/7 and RHEL 5/6/7. Is it possible to add or remove a SCSI device without rebooting a running system? Can you scan a SCSI bus for new or missing SCSI devices without rebooting? How can I make newly connected SCSI storage devices available without rebooting? What is the Linux equivalent to the Solaris command devfsadm to add or remove storage devices? How can I force a rescan of my SAN to find newly associated LUNs? What to do if a newly allocated LUN on my SAN is not available? Some nodes can’t see my new storage device, how can I make it available? After SAN maintenance activity, not all devices returned – devices in multipath missing or remain in failed state. After SAN failover testing completed, not all devices returned to running state as expected – devices in multipath missing or remain in failed state. After Red Hat Enterprise Linux 5.0 (RHEL 5) and above (RHEL 6 and RHEL 7), it is possible to make changes to the SCSI I/O subsystem without rebooting.